Hi, my name is Meghan. I blog over at Ratnam Residence about everything that goes on under our roof…. home renovations, family & finance, keeping healthy, and what recent shenanigans our 15 month old man of the house, Avery, is up to. Like my lovely friend Elske, we’ve had our fair share of sleep struggles since Avery joined us. I can honestly say, I didn’t sleep until he was a year old. Up until then, we had tried EVERYTHING. Or though we had. Then one suggestion from his doctor at his one year check up, and boom. Now he sleeps 11 hours a night! 3 to 6 months Unlike my lucky friend, Elske, my maternity leave ended at 3 months (her’s was 10 months! Lucky duck!). So ended my mid-day napping and our cuddle sessions on the couch in my pjs. I was back to work and Avery was off to daycare. At this point, we had stretched Avery’s feedings out to 3-4 hours, but trying to hold him off with a pacifier or distracting him, even if it was just for a few minutes. And we instilled a bedtime routine. Bath, jammies, lights out, humidifier on, music & books, and bed. Sure, he still got up in the middle of the night, but I kept the lights off and rocked him back to sleep, so he’d start associating dark and sleep. Since the nightly feedings didn’t stop, I was exhausted at work, but I chugged along. It wasn’t too long before Avery caught his first daycare cold, followed by an ear infection and pneumonia. He was such a trooper though, and it must have tuckered him out because just before he turned 4 months, he slept thru the night. Hallelujah! Well, so I thought. Months 4 & 5 we struggled getting Avery to sleep at night. He was up multiple times a night and we thought maybe it was a growth spurt, or he was hungry(although he ate like a champ), or it was a stage? Even with a nightly routine and naps during the day, I was frustrated and started looking into changing things up, or sleep training, at that point… we’d try pretty much anything. 6 to 12 months Our sleep struggles only continued for the next six months. It was a constant try this, ok that doesn’t work try that. Scratch that, and switch this up. In month six we implemented sleep tactics from the book ‘12 Hours Sleep by 12 Weeks.’ We tried putting Avery to bed earlier, creating a quiet down time with dimmed lights and music during his last feeding, limited rocking after he was fed, and put him to bed awake. He would cry, and we’d check on him, but never pick him up. He’d fall asleep after a few checks and in the middle of the night he sometimes puts himself back to sleep after crying for a few minutes, but I was still up a couple times a night with him. In month 7, we put Avery’s crib bumpers back in because he kept moving around in his sleep and waking up when he bumped his head on the crib. We thought it would help him to sleep thru the night… not really. To this day, Avery still moves around a ton in his crib at night. When I go in to adjust his blanket at night, sometimes I find him with his feet up on the sides of the crib, vertical in the air… silly kid. Fast forward to month 9 and we were still struggling. We had a nightime routine, and an arsenal of tools to help him get back to sleep. It also didn’t help that Avery could now pull himself up in his crib…which made getting him to sleep just that much harder. Finally, by 10 months, we had made progress. How? We took away the nightly feedings. This was no easy task, and I chose a few days my mom was visiting to help share the long nights. We swapped Avery’s bottles with water and when he woke at night, expecting (but not needing cuz he ate and drank enough during the day) milk, he was pissed! After a few nights, he was down to only waking twice a night. Progress. 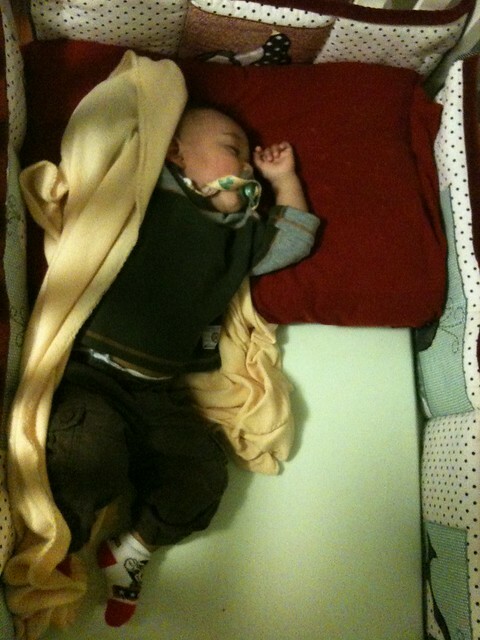 Before his first birthday I also added a foam mattress top to his crib (maybe he wasn’t comfy in his crib?) and a white noise maker (which didn’t help and I returned). 12 to 15 months At Avery’s one year check up, his doctor was appalled that Avery wasn’t sleeping thru the night. She asked about our routine and caught one thing. She said to STOP rocking him before bed. He was associating sleep with the rocking motion, so to get him to learn to fall back asleep after waking at night, we had to put him to sleep awake after our nightly routine – sans rocking chair. So, that night we sat on the floor reading books with the lights dimmed before bed. He cried a bit when we put him down, but eventually put himself to sleep. And guess what? He slept thru the night! In the months since, Avery has been (mostly) sleeping thru the night. Some nights he wakes himself from coughing and needs a pacifier to put him back down, but for the most part, he sleeps 11 hours a night, and takes a 2 hour nap at daycare. To think, after trying ALL those things to get him to sleep, and changing just one thing got him to sleep thru the night! Oh and go figure, I plan to write this and the past 4 days Avery has been waking up 1-2 hours earlier than usual… no idea why, but I’m starting to feel the effects of sleep deprivation again and I’m not liking it! I guess Avery just likes keeping me on my toes… hopefully it’s just a phase, or else it’s back to the drawing board….again! Previous It’s the words that count!